Potato Gratin is one of those dishes that is so simple to make, and the results are fantastic. 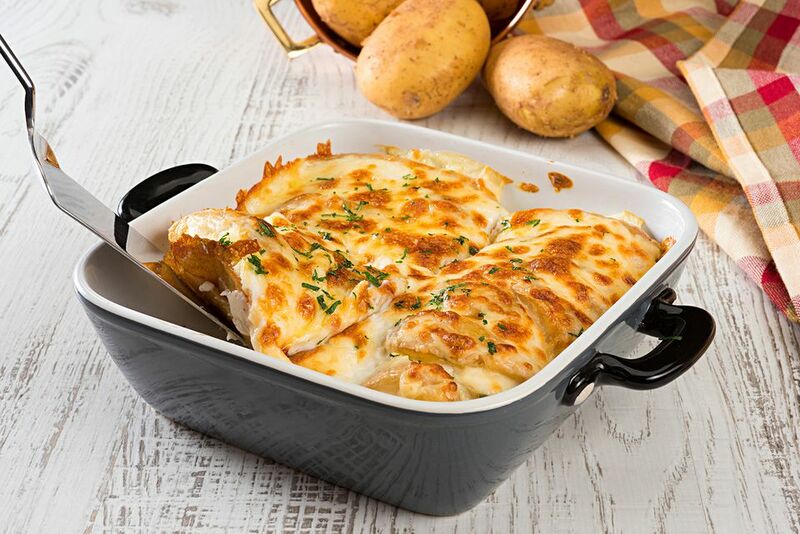 A perfect gratin is thick, rich and creamy; the potatoes should be soft but not broken up and the sauce thick and tasty. Jayne Austin Price, from France, made this Potato Gratin using a technique she discovered in an excellent book, 'A Table in the Tarn' by Orlando Murrin. Murrin is a well-known British food writer. This recipe, therefore, is based on Murrin's but Jayne has made subtle changes. The best potatoes for a gratin are floury types such as King Edward or a Maris Piper or any potato recommended for mashing. Peel, rinse and dry the potatoes then slice as thinly as possible (a mandolin is good for this, but a sharp knife works just as well). Place 1 clove of the garlic, the milk, cream, potatoes, a pinch of salt, pepper and the mace or nutmeg in a large pan. Bring to a very gentle boil and simmer for a few minutes until the cream is noticeably thicker. Remove from the heat and add the grated cheese. Stir until the cheese has melted. Generously butter an ovenproof dish then rub all over with the remaining lightly crushed clove of garlic. Pour the potato mixture into the dish, using a spoon gently move the potatoes in the cream mixture making sure all are covered. Finely slice the Brie into long strips and lay across the top of the gratin. Dot the surface with the extra butter. Season with salt and pepper (potatoes absorb a lot of salt which is also needed to add flavor). Bake in the preheated oven until the top is bubbly and golden brown, and the potatoes soft when pierced with a sharp knife. If the top is browning too quickly before the potatoes are cooked, lower the heat and cover with a piece of aluminum foil. They should take about 40 minutes in total. Serve immediately, or if you want to serve the potatoes later leave to go completely cold. Another way to serve the gratin is to allow it to go cold, and then to use a cutter, cut into rounds. Place the rounds on a greased baking sheet and reheat in a hot oven for approx 10 minutes. The edges left in the dish though are my favorite bits when scraped out with a spoon.